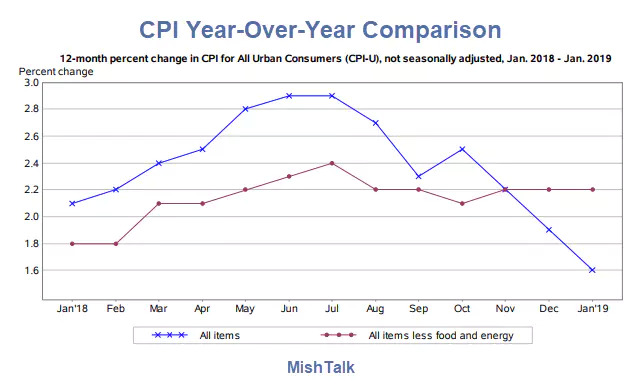 Thanks to falling energy prices the CPI is once again steady, with year-over-year rates down a third month. The Consumer Price Index for All Urban Consumers (CPI-U) was unchanged in January on a seasonally adjusted basis, the U.S. Bureau of Labor Statistics reported today. The all items index increased 1.6 percent for the 12 months ending January, the smallest increase since the period ending June 2017. The energy index declined for the third consecutive month, offsetting increases in the indexes for all items less food and energy and for food. All the major energy component indexes declined in January, with the gasoline index falling 5.5 percent. The food index increased 0.2 percent, with the index for food at home rising 0.1 percent and the food away from home index increasing 0.3 percent. The indexes for shelter, apparel, medical care, recreation, and household furnishings and operations were among the indexes that rose in January, while the indexes for airline fares and for motor vehicle insurance declined. The index for all items less food and energy increased 0.2 percent in January for the fifth consecutive month. The index for all items less food and energy rose 2.2 percent over the last 12 months, the same increase as the 12 months ending November and December 2018. The food index rose 1.6 percent over the past year, while the energy index declined 4.8 percent. Your results will vary, and possibly greatly, especially those who buy their own heal care policies. But also check out shelter, which does not reflect actual home prices. Anyone seeking to buy a home knows the shelter index is a flat out joke. I will post some charts in a bit.